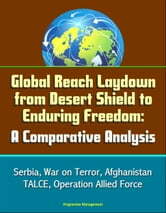 The purpose of this paper is to analyze the evolution of Global Reach Laydown (GRL) from the Gulf War (DESERT SHIELD) through ALLIED FORCE (Kosovo) and ENDURING FREEDOM (Afghanistan). This is important because of the implications for the emerging USAF CONOPS termed "Global Mobility Task Force." Although in all three of these contingencies GRL units performed their missions effectively, safely, and professionally, there were many lessons learned. A GRL model is used to analyze and compare these three contingencies. Variables in this model including availability of bases, communications, supply, training and readiness, command relations, user education, and use of guard and reserve personnel. Major conclusions include the need for Air Mobility Command (AMC) to better support their GRL units, the need to educate users on how to effectively utilize these assets, the requirement to finally resolve recurring supply problems, and the need to better integrate reserve and national guard personnel. With the war on terrorism predicted to take years to fight, and the multiple flashpoints of terrorist activity already documented in over fifty nations, the increasing need to improve the GRL concept is apparent. It is therefore essential for these recommendations to be implemented expeditiously.